This groundbreaking book explores the relationship between the impact of urbanization on the working class in Latin American cities and the variety of responses by that group in the years between 1870 and 1930. Unlike urban geographies or political histories, the chapters of this collaborative volume focus on the people of these cities, especially the working women and men who were faced with the ramifications of the transformations taking place around them.Each contributor provides original research and analysis on a selected city and addresses three core questions. First, what were the circumstances for working women and men in the growing cities in early twentieth-century Latin America? Second, how did this population respond to the problems they faced and act to improve the quality of their lives? And, third, what circumstances and what strategies were most likely to have a lasting impact? 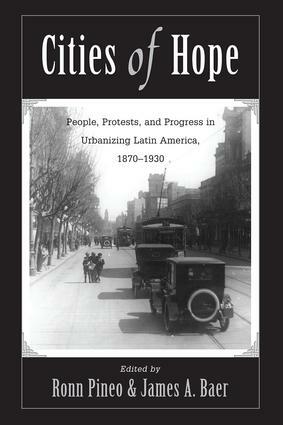 The case studies demonstrate how exploring the patterns of working class' response provides the key to understanding the political process of the urban social reform.Filling significant gaps in the literature on Latin American social history, working class history, and the history of urbanization, Cities of Hope is written in a clear, accessible style, making it an excellent choice for course adoption in classes on urban studies, sociology, or Latin American history as well as a vital reference for scholars.